FREEBS! Press pause on the DVR, set down your curling iron, pull over, stop whatever you're doing and RUN to your computer! Over the weekend The Disneyland Resort raised their ticket prices effective immediately. 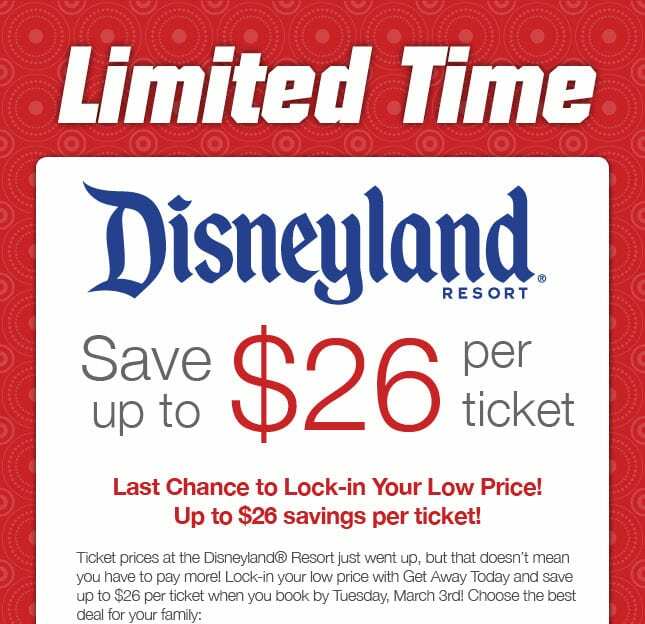 Fortunately, Get Away Today has locked-in our low prices on Disneyland Resort Tickets until March 3rd. Guests must purchase their Disneyland Resort tickets with Get Away Today on or before March 3rd to save the most money on their Disneyland Resort tickets. It’s not a lot of time, so we need your help spreading the word! We want to save your readers to save the most money on their vacations. Our discounted tickets are valid for travel through December 31, 2015. Whether they’re thinking of traveling for Spring Break, Summer, Halloween Time or the Holidays, now is the time to purchase. Our no-interest layaway plans allow them to lock-in their savings for only $125 down. To make it even easier, get all the details on the offer HERE. So, seriously…if you are planning to go to Disneyland any time in 2015 buy them now. That $26 really adds up! You may now resume your regular scheduled activities.